John M. Malin, who died at Rockport, Summit County, Utah on September 2, 1896, was born on the 16th of April 1933, at East Nantmeal, Chester County, Pennsylvania. He was quite weakly during his childhood; in fact during the first year of his life he was carried on a pillow. He was sent to school when six years of age and remained in school only until he was ten years old. His parents, having joined the Church of Jesus Christ of Latter-Day Saints while he was going to school, his fellow pupils began to persecute the little Mormon and were so abusive that he was forced to leave school. He was baptized by his father on the 16th of November 1841, in that historical river, the Brandywine, and from that day until his death had no doubt as to the truth of the Gospel. Never was there a waver in his faith. When upon his death bed [at age 63], almost his last words were "I have kept the faith." With his father's family [see Elijah Malin Jr and Sarah McGuckin history] he gathered with the Saints at Winter Quarters [the Saints had been driven out of Nauvoo, Illinois and were camped near Florence, Nebraska] in 1846. During the winter of 1846 and 1847 they lost most of their live stock which was a sore trial to them. In the spring of 1848 the family moved across the Missouri River to where Omaha now stands. His father [Elijah Jr.] then returned East to look after some property and also to fill a mission. While on his return to his family he died of cholera at St. Louis, Mary 5, 1849. The family, having received no benefit from the property which the father had gone to look after, were left destitute. John was then a lad of sixteen, the oldest child in the family. Upon him the family depended for support, and right manfully did he labor both early and late that the "wolf" might be kept from their door. He [John] was ordained to the Priesthood in August 1849 at Birds Settlement near Council Bluffs, Iowa. Notwithstanding their poverty during these trying times, the family were never in want and always had plenty to eat. This was a fulfillment of his mother's blessing that..."they would never want for food." It might be mentioned here that John Malin's father [Elijah Jr.] helped to fit the good ship Brooklyn, which sailed around Cape Horn to California. In this ship he sent some very valuable goods, with the proceeds of which, when sold, John was able to buy a team and wagon outfit with which to come to Utah. The family left for the Valley of Great Salt Lake on May 1, 1851, and during the trip across the plains John [now age 18] supplied the camp with game and was considered the best hunter in the train. He killed the first and last buffalo on the trip. After arriving in the valley, he made his home in Salt Lake City for a number of years. Some ten years later, John and his brother James went to Rockport, Summit County, and procured some land there, going back and forth to care for it. In 1864, he married Alice Smith and two years later he moved his family to Rockport and established a home there. In Rockport, he was called as counselor to Bishop Edwin Bryant and later served as Ward Bishop for over eighteen years until his death. His principle labors were farming, live-stock raising and logging. When the Ontario Mine came into being at Park City, about 1873, and wishing to augment his earnings, he contracted to help supply the mine with coal and carried on this work until the railroad came into Park City in about 1883. The coal was hauled by team and wagon from Coalville to Park City. This necessitated the employing of many men for the hauling. His own son Elijah at the age of eleven years hauled the coal along with the men handling the team like an expert. In 1886 he entered into another contract to help supply the Ontario and Marsac mills with cord wood. This contract lasted all his life, his sons Dea and Ed, carrying on for some years after his death. The wood was obtained through logging the nearby canyons, and sawing and chopping the logs into proper lengths and hauling by team to Park City by way of Three Mile canyon and over the hills. Much of this work being done in the winter, it called for much strenuous work on his part. His boys Dea and Ed worked along with him like men from their very early years. As before with the coal contract it called for employing much help, and John thus was able to supply work for his town folk, which was a great service to them all. John resided in Rockport for thirty years where he was the Justice of the Peace for a number of years. This office together with that of Bishop accounted for the numerous marriages he performed. The young people coming from all parts of the county for this service. Being of a very generous nature, there were very few fees ever collected. He and his wife Alice had eleven children, four sons and seven daughters. [See family photo below.] John M. Malin was a kind and affectionate husband and father--a man who was highly respected by all who knew him. During his early life in Utah he was frequently called upon to defend his property and that of his neighbors against depredations of the Indians. He was one of those who went out to the Echo Canyon War and was a Black Hawk war veteran. He was always on hand to protect and defend his brethren. He was a good citizen and a typical pioneer. John was always a public spirited man, and as Bishop of his ward saw that holidays were fittingly observed. He was instrumental in securing a park for the boys to play ball, and persuaded the townsfolk to give their boys Saturday afternoons off to play, so they would not do it on Sunday. He lived and died a faithful Latter-Day Saint in every deed. He was acquainted with the prominent men of the Church and State and had their confidence and friendship throughout his life. PATRIARCHAL BLESSING-John McGuckin Malin [age 44 when he received it], copy from LDS Church Historical Dept. No. 741 Rockport-Summit County, UT August 13th 1877 A blessing given by John Smith Patriarch upon the head of John McGuckin Malin son of Elijah and Sarah Malin born in East-Nantmell Township Chester County Pennsylvania August 16th 1833. On January 2 1864, Alice married John M. Malin. After two sons were born the oldest of whom died at the age of seven months, they moved from Salt Lake City to Rockport, Summit County, Utah. This was in the month of May when the Black Hawk Indian war started. A few weeks later, as everyone had to live together for protection, they moved to Wanship from Rockport, (then called Enock.) Later a fort was built in Rockport and they moved back for the winter. The Indians caused trouble all winter, demanding flour and meat. The people met these demands to keep the peace. The life of Alice Malin Smith has been an inspiration to all who have known her. For many years, she shared with her husband the responsibilities he bore as Bishop of the Rockport Ward. Always one who visited and cared for the sick and she sewed for the dead and helped prepare them for burial. Besides sewing for her own children, she often made the "holiday dresses" for the neighbor's girls as well. For ten years she presided over the Primary Association of this same Ward. She was also a Councilor in the Summit Stake Primary Association. She was the first school teacher in the village of Rockport. These services were performed in the closely scheduled spare time of this noble pioneer mother, who reared a family of eleven children, two of whom died very young. 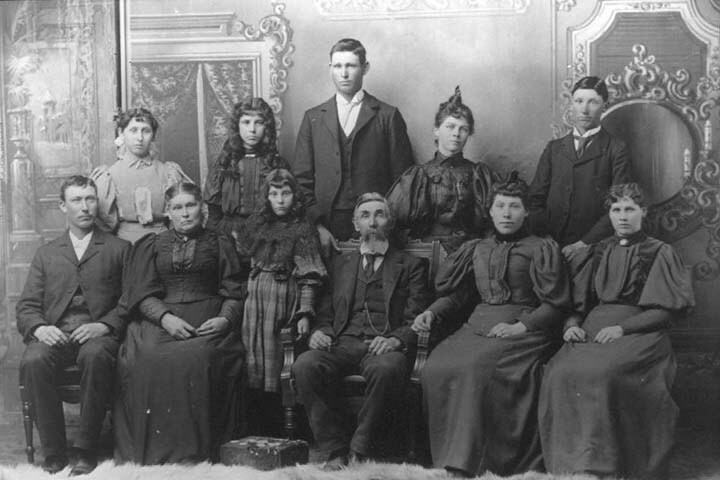 Second Row: Ethie, Thurza, Dee, Hattie and Ed; two children died young-John at age 7 months and Mary Alice, age 10. For thirty seven years, Alice Smith Malin, lived in the little village of Rockport, Utah. Her husband John M. Malin passed away at their ranch home 2 September 1896. Shortly thereafter the widowed grandmother moved to Salt Lake City and took up her residence in the tenth Ward. Here she worked in the Relief Society for a period of ten years. Later she built a home at 1074 Harvard Avenue, and lived in the LeGrande Ward. She took a keen interest in the work of the Daughters of Utah Pioneers. She was among the first to join the LeGrande Camp of that organization. Her neighbors knew her for kindness, her generosity and her congenial friendliness. Her countenance was beautiful and her soul radiant with cheer and happiness. She loved her neighbors, sharing their sorrows and their joys. She was interested in civic affairs and was well advised upon all matters of politics and religion. She loved her children, her grand children and great grand children and they also loved her. On the morning of 16 Oct 1930, while biding good bye to her friends before taking her departure for Los Angeles, California, Alice Smith Malin was stricken with a heart attack. It was the final summons. She answered the call bravely. Less than fifteen hours later she was gone. Her passing was beautiful. She was surrounded by her loved ones who ministered gently and kindly to her needs. A great throng of relatives and friends paid solemn honor to her memory at her funeral services, on Sunday 21 Oct 1929 in the LeGrande Ward Chapel. Thus ended the mortal career of Alice Smith Malin, eighty four years of age, a girl convert, a sturdy pioneer of the great intermountain west, a noble wife and a devoted Christian mother. When I was eleven my cousin Alice Vernon, from Rockport and I went to Salt Lake City on the Park City train to visit. Grandmother and aunt Thurza had moved into their new home at 1074 Harvard Avenue, just off the eleventh east car line. We got off the train at the Sugar House station and took the street car going into town. Grandmother was at the Harvard Avenue stop to meet us, helped us off with our suitcases and took us to her home. She was so happy with her new home. She said it was called a bungalow, because the roof came out over the windows and kept the house cool. There was a concrete walk up to the front porch, around one side of the house and to the back porch., around one side of the house and to the back porch. There were outside water taps to turn on and a rubber hose that carried the water to the flowers or to the lawn. There were flowers of all colors: some I had never seen before. There were red roses and tall flowering bushes. I was familiar only with yellow roses and the small pink wild rose. Grandmother had lilies of the valley, snow balls and flowers that I had never seen before. Then we went inside and she showed the sink with both hot and cold water, the electric light bulbs in every room. [Time period probably 1920s. Thurza married a widower Rex Winder in 1924.] The bath with the big white tub and a toilet inside the house. To me, the country grandchild, the city conveniences were wonderful. There was the ice box where the iceman put in huge chunks of ice, a milkman delivered milk every morning and even a bread man and vegetable man came to her door. Best of all was the ice cream man who called in the hot afternoons. Alice and I had our own money for ice cream. The train conductor, at the milk station at Parleys Park, helped us get on the train and declined our one dollar that we offered for our tickets. Cousin Alice and I went from room to room. There was a beautiful flowered carpet in the parlor, a new piano, pretty chairs and tables. There were two bedrooms, a dining room, kitchen and ....what she called a basement. It had concrete floors, a shelf all around the room on which she put her many bottles of fruit. There was a big furnace room and another sleeping room. It was so cool in the basement on extra hot days. Aunt Thurza and grandmother had planned something exciting for Alice and me to do each day. The second day of our visit we went downtown on the street car by ourselves. That day we learned which was Main and which was State streets. We learned to watch for street signs and where to get off the car and where to get on the car when coming home. We looked in all the windows, walked to the Temple block, looked at the Brigham Young monument, and then took the street car back home. The next day we went again down town. This time we found that Drug Stores sold ice cream sodas in tall glasses and you used a straw for getting the delicious drink. Another day we went by ourselves to Wandamere Park and had a merry-go-round ride, had our pictures taken and completed right there. Such Fun! Then there was pink lemonade and a boat ride, and we saw a few animals. In a few days someone from Rockport called for us and we went back home in an automobile. This was my second time in an automobile and I was delighted. Years later aunt Thursa told me when the home was completed and paid for, they had it dedicated by prayer. In the prayer the home was to be a place for those in sorrow to come. To her descendants it was a place to gather and renew our love...her home was the "Grand Hotel". If relatives came to town, even to see a doctor, and did not call at her home, she would say Why! at their next call. I remember grandmother Malin as a large woman, weighing about one hundred sixty pounds. She had blue eyes and steel gray hair. Her sister aunt Nellie was a smaller woman and had gray hair when I knew her. Grandmother described her youngest sister aunt Ella Laney as being small, petite, blue eyes and long golden hair. I loved to watch grandmother comb her hair. She would wet her hair in the bathroom then sit in a low rocking chair in her bedroom, without a mirror. She would then part her hair exactly in the middle, pull down soft waves on both sides, then brush all the long hair in one coil and make a bun at the back of her head. To me grandmother had such pretty clothes. She had a number of dresses in shades of lavender, mauve and blue. She had been a beautiful seamstress and had made many wedding dresses in her younger married life. In her later years she had a seamstress who made these best dresses for her. But grandmother made her own house dresses even into her later years. I remember the pattern so well. It was a two piece dress. The skirts were either gored or gathered at the waist line and she wore her clothes almost to her ankles. The blouse always opened down the front with buttons for closing. The sleeves were long and had a band at the wrist. This she could unbutton and roll up the sleeve, if needed to be short. The perky part of the dress was the bias flounce on the waist band. Then she added different lace collars at the neck, pinned with a fancy broach. These dresses were made of gingham or calico, while her best dresses were made of wool, satins or crepes. Grandmother made many quilts. Some were fancy patterns and others were flannel and tied with colored yarn. She made quilt tops for all of her grand children. Often friends came to the home to help stitch a quilt. Grandmother attend Relief Society especially on quilting day. She was most faithful in all her religious duties. She accepted assignments and was a visiting teacher at an elderly age. The home was near the church building and they walked to most of their meetings. Grandmother was reading the Doctrine and Covenants the year that I taught school and boarded at her home. She was never idle unless it was in the last years, when she rested in her front porch swing. This she enjoyed. Grandmother was a good cook. How good her beef vegetable soup tasted and her homemade bread was delicious. Grandmother kept up with world, local and church news. She read her daily paper and had all of the church magazines. If a government official was giving a lecture, she was there. She said one time as we were going to the tabernacle to hear President Woodrow Wilson, "Let me find my own seat. Someone will find room for an elderly lady." She attended conferences in the Tabernacle and went to see plays in the Salt Lake Theatre. Grandmother was an active member of the Daughters of the Utah Pioneers organization. She was a pioneer herself and walked most of the way from Winter Quarters to Salt Lake City, at the age of seventeen. Having an automobile ride was a great pleasure to her. She expected, and was taken for rides with her grown up grand children. The automobile was more than a pleasure ride. It seemed to thrill her to be able to go to see her daughters in Summit County, in such a short time. After my marriage the Malins had a picnic reunion in Cottonwood Canyon. While there a plane flew over us and grandmother said to me, "I have a special thing to do before I die. I want to have a ride in an airplane. How can I meet John on the other side and not be able to tell him I have had a ride in this wonderful invention." The next year while in Los Angeles or San Francisco, she had a ride out over the blue Pacific. Under the seat of the dining room bay window, grandmother kept an assortment of toys, for her grand children to play with. I remember best the two dolls. The bodies were made of cloth and stuffed with rags or fine sawdust. The extra pretty doll had a head made of china. The hair was painted black and the eyes, mouth and nose were painted in colors. This doll was given to the older small children to rock and love. The other doll with the tin battered head was for the tiny children to drag around at their pleasure, even if more dents were made. The small children all knew where to find these toys...I often reflect on the goodness of her life and her example to her descendants and thank my Heavenly Father for such a noble ancestor. © 2005 Lin Floyd, to contact me for more information, email lin at sunrivertoday dot com.